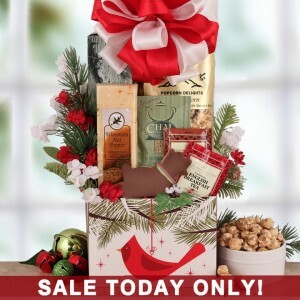 Gift Baskets On Sale Today Only + Choose 2 Day Air! Wasn’t it July just a moment ago? In the ring of a jingle bell, it’s suddenly only a handful of hours until Christmas Day. Our elves here at Bisket Baskets have been happily filling Christmas gift basket orders, and in the spirit of goodwill, we’ve decided to put some of our most-loved Christmas gift baskets on sale, for today only! If you order today, you can select the 2 Day Air shipping option so Santa and his reindeer (er, the Postal Service) can speedily get your holiday gift basket to you by Christmas Day. 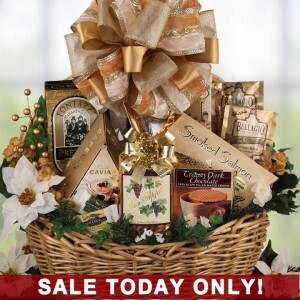 You can shop our Christmas Gift Baskets On Sale by checking out any gifts with the “Sale Today Only!” banner on them. We’re gifting you with prices reduced by even $50, in some of our gift baskets – and as always, your gift will be beautifully designed and filled with all the gourmet goodies we list in the product description. Here’s some highlights – and remember, 2 Day Air is your friend as Christmas nears! The Ritz At Christmas Gift Basket: Originally listed at $174.99, this robust gift basket is on sale today for only $159.99! It features glittering gold décor, mixed with goodies like caviar, smoked salmon, toffee pretzels, chocolate pastry, Ghirardelli chocolates, and much more. Home For The Holidays: Frosty the Snowman might be feeling a little chilly, but this snowman-themed Christmas gift basket sends so much warmth! Originally at $94.99 and on sale for $89.99, this is a wonderful gift for your in-laws, a family member’s significant other, or a next-door neighbor. Grand Christmas Gourmet Gift Basket: This is another of our most-loved Christmas gift baskets, filled with gourmet cookies and cream chocolate bark, seasonal drink selections, butter toffee pretzels, smoked salmon, and more deliciousness! It’s perfect for gifting to an entire family. It’s on sale for $119.99! We have 14 Christmas Gift Baskets On Sale, all filled with festive goodies that are wonderful for gifting to friends and family, and very economical for gifting to an entire family. We also have three Pet Christmas Gift Baskets on sale too, so cute for all those pet lovers in your life! Sure, 2 Day Air costs a bit more, but with our Christmas gift baskets on sale, you’ll be able to balance out the cost of shipping it quickly. After all, you want the holidays to be perfect, and we’re here to take the stress away and make them as perfect as possible for you! Happy Holidays! Gift Baskets Free Shipping From BisketBaskets.com! Christmas is only a handful of days away, and if you’re like us, we just can’t wait to hear those reindeer hooves on our roof and a certain red-suited and white-bearded man scurry down our chimney. We’re so excited to be in the holiday spirit, so we’ve decided to extend our Gift Baskets Free Shipping – simply use code “12FS11” during checkout! Be sure to consult our Shipping and Delivery times so you can determine whether your holiday gift basket will arrive in time for December 25th. It’s cutting it close, but with all the hustle and bustle of the holidays, we can bet there’s more than a few people on your gift list who you’re exchanging with after the holidays – making gift baskets free shipping the perfect choice for you! Let It Snow Gift Basket – This free shipping gift basket is decorated with tons of frosty snowmen, and filled with goodies like shortbread cookies, honey roasted snack mix, snowflake cookie, seasonal drink selection, and more! Christmas Morning Tea – Our Christmas morning tea free shipping gift basket is so soothing for any morning during the year! It’s filled with Biscotti, chocolate cookies, gourmet caramel popcorn, and of course, Bigelow tea! Holiday Drum Gift Basket – This free shipping gift basket not only comes in a pretty holiday container, but is filled with scrumptious goodies – chocolate peppermint cookies, raspberry cookies, chocolate raspberry bark, holiday pasta with roasted garlic cream sauce, and so much more. Who needs shipping costs this holiday season?! Simply shop our Gift Baskets Free Shipping collection to get those last minute holiday gifts covered – it’s only a handful of days till Christmas, so these gifts are so perfect for all those people you’ll be gifting after Christmas Day, too! Dogs just seem to add even more holiday happiness to the holiday season, and we couldn’t imagine a Christmas without Baxter or Fido “helping us” open our gifts under the tree. Of course, we need to use common sense and keep our dogs away from holiday “n-o’s” like tinsel, poinsettias, tree water, chocolates, and any small gifts and objects they can choke on. That’s why whipping up dog-approved treats and wrapping them up for your pooch, or a friend or family member’s dog, is a fun way to show that special dog in your life some holiday love, too! Oh, and gifting Holiday Dog Gift Baskets helps you do just that without taking the time to bake your own treats, and many of our holiday dog gift baskets include people-approved gifts, too. Place the peanut butter in a microwave-safe bowl, and microwave it until it is melted. Add the yogurt to the peanut butter, and mix. Pour the combined mixture into the cupcake papers, and freeze until solid. Gift to Fido, and enjoy! Then add ¾ cup oil, 2 eggs, 2 tablespoons brown sugar, and 5 cups of whole wheat flour to the bouillon mixture. Stir it all to form a very tough dough blend. Roll the dough out, and use holiday-themed cookie cutters to cut the dough into shapes. Cover a cookie sheet with foil, and place the holiday-themed cookie shapes onto it. Bake at 300 degrees F for 40 minutes. Turn the cookies over after 20 minutes. Place the cookies in a cute gift bag for Baxter, and help him open it on Christmas morning! We had the pleasure recently of adding quite a bit more Wine and Chocolate Gift Baskets to our wine gift baskets collection, and we’re pleased to announce that we’re now able to ship wine directly to your door, opening up a whole new window of wine gift basket options! Speaking of options – wine and cheese tends to be the go-to wine pairing, but chocolate has taken on a decidedly gourmet form over the last few years. Wine and chocolate pairings are more popular than ever, and we’re here to share some delicious wine and chocolate coupling ideas with you! It’s hard to find someone who doesn’t love the smooth taste of milk chocolate – it just seems to conjure up happiness! Choose a few of your favorite milk chocolate candy bars, and stick with wines like a Pinot Noir, a Reisling, dessert wines, or even a sparkling wine. These are all lighter wines that will accent, but not overpower, the chocolate. We’ve been hearing so much about the health benefits of dark chocolate, and when you pair them with the reported benefits of red wine, well, we’ve got a wine coupling that’s good for us, too (in moderation, of course)! Dark chocolate has a very strong flavor, so you need a full-bodied wine to go with it. Go for a Merlot, Cabernet Sauvignon, Zinfandel, or a Pinot Noir. Take a bite into a white chocolate bar…mmm. Doesn’t it just seem to have a buttery flavor? Think “fun” when you’re choosing a wine to pair it with – namely, a sweet or dessert wine. A Sherry or a Moscato wine is fabulous for it. Want to walk on the wild side? Pair it with its alter ego – a Zinfandel. The coupling of these two tend to balance each other’s “rough edges” out. 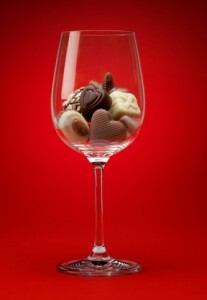 Move over wine and cheese – wine and chocolate pairings are a fun, gourmet alternative to traditional wine couplings. Many of our Wine Gift Baskets feature gourmet chocolates, so the gift recipient will be all ready to enjoy wine and chocolate pairings – courtesy of your thoughtfulness!